Under the Affordable Care Act, federal subsidies, or tax credits, help more than 80 percent of marketplace enrollees purchase health insurance. The amount of the tax credit is based on income and the cost of coverage, but generally, the lower the income, the higher the tax credit. People who earn more than four times the poverty rate don’t qualify for tax credits under the ACA. They must pay the full cost of coverage. Republicans would offer a similar tax credit to all who purchase individual insurance. It would be based on age and income and would be adjusted annually for inflation. Plan members in their 20s would get tax credits in the $2,000 range. Those in their 30s would get roughly $2,500 and people in their 40s would get roughly $3,000. People in their 50s would receive tax credits of about $3,500 and those over 60 would get roughly $4,000. 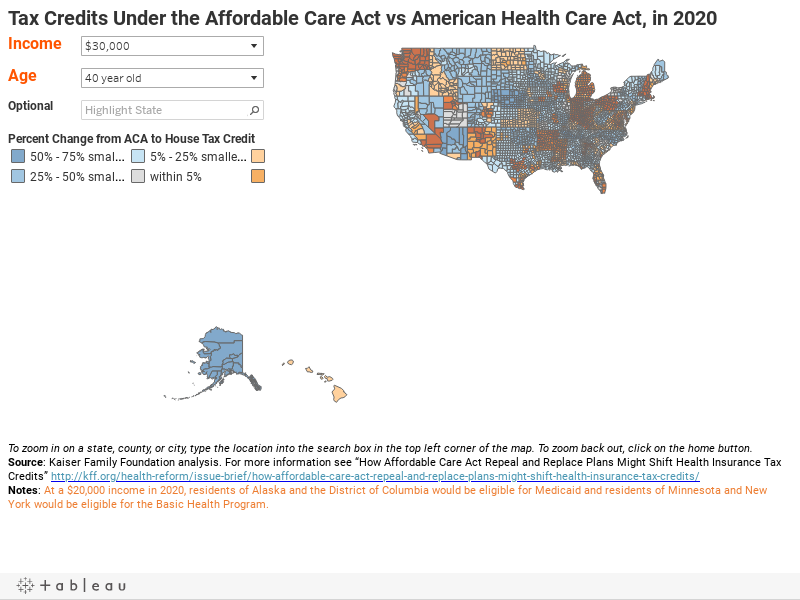 The foundation also offers a column by column breakdown of how the Republican proposal compares with the ACA.